Solder a real test instrument to your board using an intelligent and fully isolated analog input module. Allied Component Works has introduced a board mounted analog input module with specifications similar to a hand held DC volt meter. Any measurement function that can be completed with a DC volt meter can now be embedded directly in circuit with minimal software. 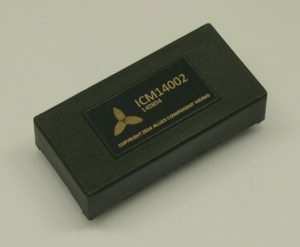 The ICM14002 is an isolated analog to digital converter module with an intelligent SPI interface. High impedance inputs with ±1V and ±10V ranges allow direct connection of sensitive circuits, while isolation eliminates ground loops and level shifting considerations. Measurements of DC voltage are provided through the SPI interface directly in 100μV or 1mV counts, reducing host software complexity. Built in calibration functions allow for system level calibration management. The specified isolation of 2500VAC is tested for each module. Full encapsulation maintains the integrity of the high impedance input circuits and the specified isolation rating against the effects of age and contamination in challenging industrial environments. This module was developed in part to provide a uniquely flexible function block in an easily integrated format, but also to develop the processes necessary to reliably and cost effectively mass produce encapsulated integrated component modules for niche applications. The product is available now on our product showcase.